LEE COUNTY, Fla. -- A Fort Myers Police officer with a social media beef has a lot of people outraged on his behalf. But it may all be a major misunderstanding. 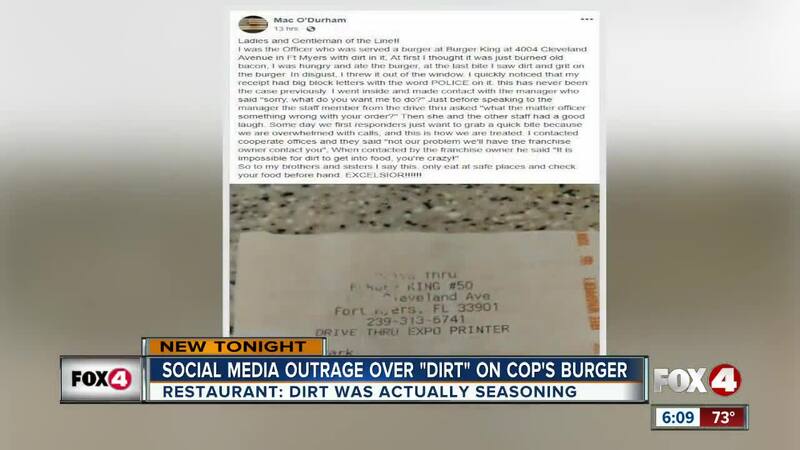 A few days ago, an officer posted on Facebook that the Burger King at the corner of U.S. 41 and Winkler Avenue served him a burger with dirt on it. At first I thought it was just burned old bacon, I was hungry and ate the burger, at the last bite I saw dirt and grit on the burger. In disgust, I threw it out of the window. I quickly noticed that my receipt had big block letters with the word POLICE on it. The officer writes that the staff at the restaurant laughed at him when he returned to talk to the manager. The post was shared tens of thousands of times, with many people calling for a boycott of Burger King. However, the CEO of the franchise that owns the restaurant told Fox 4 on Thursday that it wasn't dirt, but seasoning. The Fort Myers Police Department has released a statement about what happened.